Welcome back to the Owl & Weasel! Let's set the controls for April 1976 and see what we can learn about the hobby's history. In something of a first O&W features a number of new "SF/F" games. 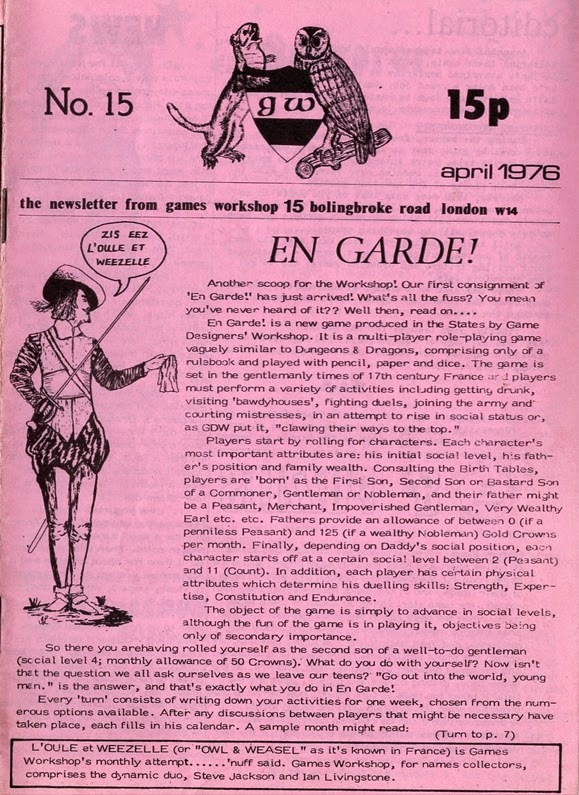 Page 1 (and 7) is an overview of GDW's En Garde game. I don't recall this game very well to be honest and had to go look it up. SPI's Sorcerer is also covered, briefly, and a new miniatures game "Wizards & Warefare". All of which shoe some common descent from D&D. In another first O&W also reviews a couple of "pub" Video Games. These are the cabinet style video games, not the home versions that became more popular after the introduction of the Atari 2600 some 18-20 months later. Pages 10 and half of 11 deal with the new D&D society. I am beginning to see, or rather have more evidence of, the reasons why Gygax felt the need to codify the D&D rules into AD&D. Everyone was off doing their own thing how they liked. Not to different than today to be honest. In this issue there are more "RPG" elements and less board game material than previous editions. I expect this trend to continue.